As you pass over the lip of State Highway 1 into the centre of Dunedin, you drive by where Carisbrook used to be - the place they named the House of Pain. It used to be a ground where opposition sides quaked in fear at what they were about to be victim of. The crowds bayed for an All Black win and a convincing one at that. But driving past the stadium's former site, you would have no idea what used to be there. It is just a building site with no sense of past glory - the latest planned use for it is for it to turn into an industrial park. All that remains of the old stadium is the Neville St turnstile building. The old terraced side of the ground is gone with rubble sitting where people used to stand; it is perhaps apt in this modern age of ever-modernising rugby that it was the corporate boxes that were last to go. For England they will have nothing but bad memories of playing there. They have played there twice and shipped 100 points in total with their biggest ever loss to New Zealand coming there in 1998 when they fell 64-22 on the Tour of Hell. For England forwards coach Graham Rowntree, he has those memories of the 1998 defeat but the pain is lessened slightly by his win there with the Lions in 2005. "The House of Pain. I have good memories of playing at Carisbrook, apart from getting smashed there in 1998. I played there for the Lions - we had a great game there against Otago in 2005. It has a lot of history to it, but I'm sure this stadium tomorrow will be buzzing." And so out with the old and in with the new. Saturday's Test will be played under the clear plastic ceiling at the Forsyth-Barr Stadium - as one journalist called it this week, New Zealand have gone from the House of Pain to the House of Pane. It is a very impressive place. As you stand in one of the main corporate boxes looking down on the pitch, you are struck by how steep the stands are and their close proximity to the turf. It is still a fearsome place to play with the atmosphere there notorious for its volume. 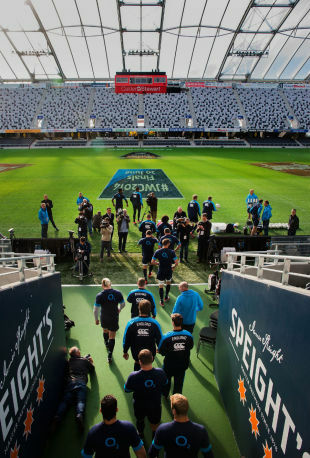 While England played two lost two in the old Carisbrook, they have won three from three in the new Dunedin stadium with all three matches coming during their ill-fated 2011 World Cup. Despite their 100% record, Rowntree will not think of it as a favourable venue. "I wouldn't say we feel at home," Rowntree said. "It's a great stadium, we trained there this morning I remember our World Cup games there particularly the Argentina game. There was one hell of an atmosphere inside there It's very impressive and a great track. It will be a dry game obviously." And with all the talk this week of England wanting to play a slow game to prevent the All Blacks from getting any momentum, Rowntree feels the fast turf will suit England. Forsyth-Barr Stadium, at Test level, sees an average of 48 points scored so expect more of the same on Saturday. England never succeeded in the old Carisbrook, the All Blacks had plenty of joy there losing just five Tests in 38. The All Blacks are two from two in their new base in Dunedin but on Saturday England have a chance to lay down a marker in what can only be known now as the Greenhouse of Pain. Tom Hamilton is the Associate Editor of ESPNscrum. Tom Hamilton was brought up near the stands of the Recreation Ground and joined ESPN in 2011. He is now Associate Editor of ESPNscrum.